Dnipro have beaten Spurs, St Etienne and Ajax at home in the last year or so. Napoli's heavy favouritism has to be questioned given their leaky defence. Moscow were unbeaten in 13 European outings before losing with 10 men in Naples. The Italians have lost three away games in a row in Serie A. 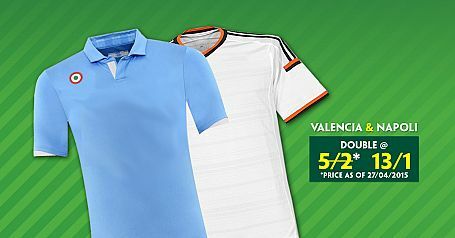 Open a new account with Paddy Power, place your first bet as a double on Valencia & Napoli both to win and get enhanced odds of 13/1. New Betfair Sportsbook customers can get 4/1 Napoli to beat Dnipro plus money back as a free bet if you lose. The former Swansea man is proving a highly dangerous customer for his new team Napoli.